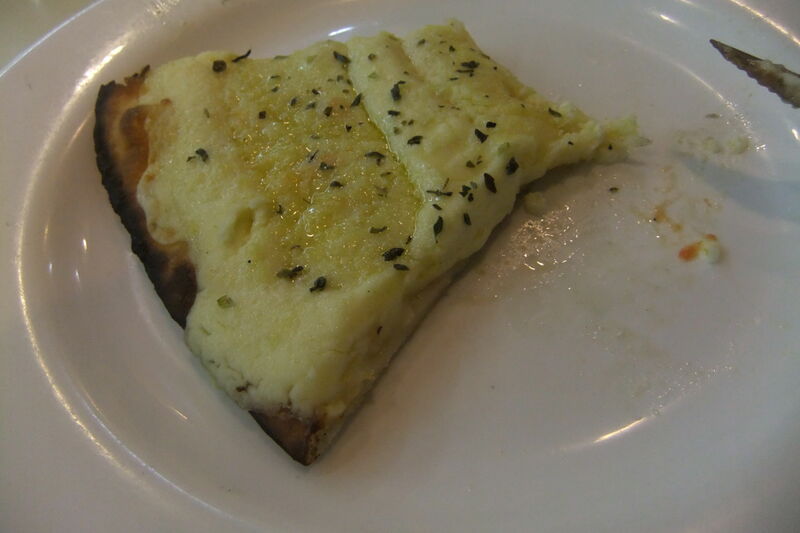 Friday’s Featured Food – Brazilian Pizza in Sao Paulo Bakeries! I know what people will say before I even start here and that is “how can you call it a pizza if it’s not from Italy?” but seriously, I’ve been to Italy 3 times so I know what Italian pizza tastes like and I know it’s good. That’s beyond question! Or stating the obvious. 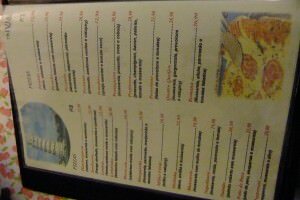 Then I heard that Sao Paulo in Brazil is one of the best places to try pizza OUTSIDE Italy so I headed there! Sao Paulo in Brazil is “a monster” – do these skyscrapers ever end? I didn’t have an answer so I settled for beer and pizza! 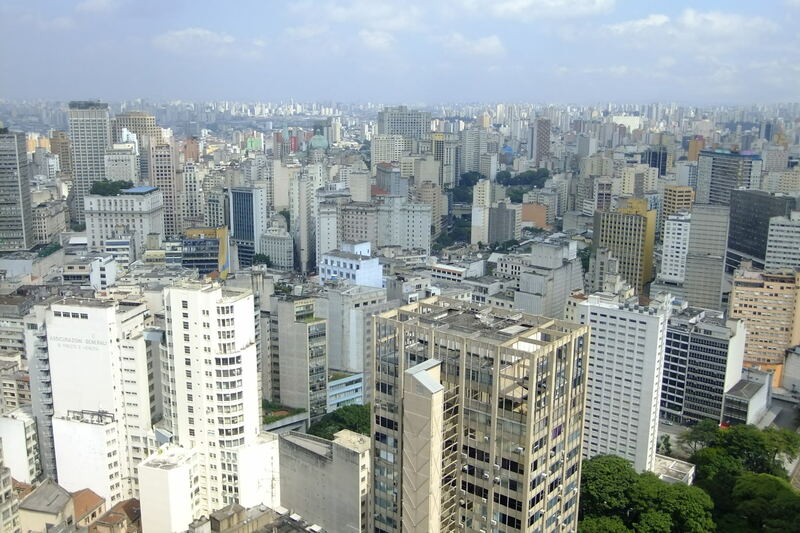 For a start, please note that Sao Paulo is a mega busy city. Even the Lonely Planet calls it a monster!! The term monster very much sums Sao Paulo up! But away from the skyscraping metropolis, I found time to relax and visit no less than 3 Brazilian Bakeries. I was a food and drink addict in Sao Paulo, inspired by the delicious pizzas and the cocktails from my “local pub for 4 nights”, Rei Das Batidas. Sunset in Sao Paulo meant pizza, beer and cocktails! First up a definition is needed: What is a Brazilian Bakery? I posed that question to my good mate Rodrigo on my first night in Sao Paulo. Rodrigo is a good friend of mine who I met in Antarctica in 2010 and have since travelled to Indonesia with. While staying in Sao Paulo, I stayed in Rodrigo’s flat which is near a river and a university (as Sao Paulo goes, that’s probably a decent description!). Hunger and thirst had kicked in after my first tour of the streets and University near Rodrigo’s flat and my brain was telling me “beer and pizza!” So it was off to find a local bakery. It didn’t take long, these “bakeries” are scattered all over “the monster”. 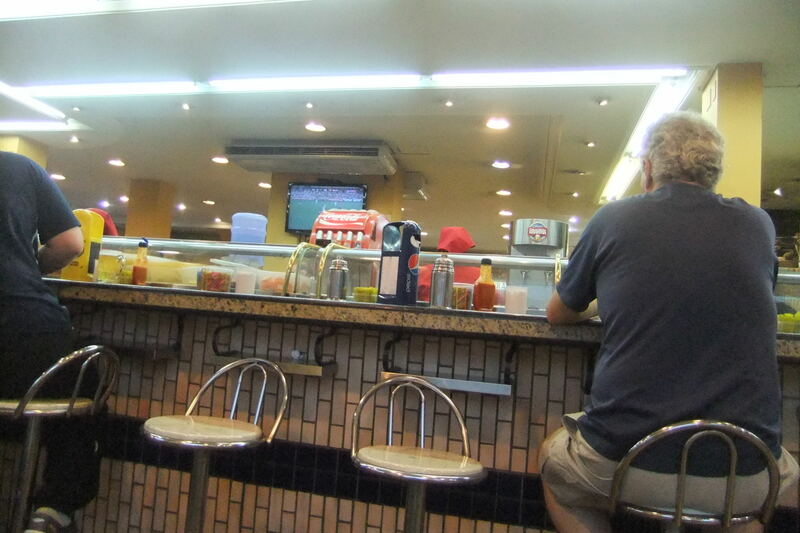 My view in a Brazilian Bakery – lots of these places in Sao Paulo – worth a visit to grab a pizza!! Why do I call them bakeries? Because that’s the term Rodrigo used, and it fits so I’m using it. Rodrigo is a local Sao Paulo resident. He knows the ins and outs of the city. What exactly is a Brazilian Bakery? It is kind of a mix between a café, a restaurant, a bakery and a bar. Basically it’s a cheap, quick and easy place to eat in Sao Paulo. What was even better was that the bakeries we visited were all relatively quiet, as I was staying outside the main city centre. This meant we could really relax in Sao Paulo. 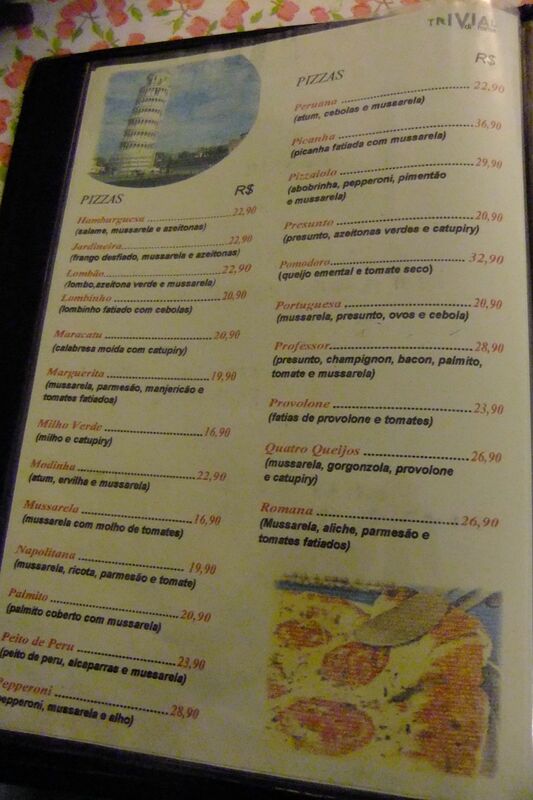 Enough about Brazilian bakeries, what was the pizza like? A slice of Brazilian four cheese pizza in Sao Paulo, Brazil. Delicious. Totally top notch. I have to say that YES, Sao Paulo is the best place to eat pizza outside of Italy. Heaped with cheese, oozing with flavor and endless in variety, these Brazilian Bakeries sure know how to make and cook pizzas! 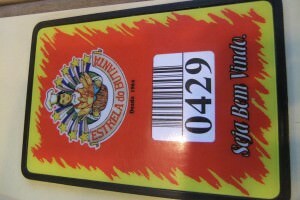 Estrella do Butanta – one of the Brazilian Bakeries I tried the awesome pizzas in! I was addicted to them, and we visited a further two of them during my time in “the monster”, gulping down beers with our pizzas before heading for Brazilian cocktails at the local Rei Das Batidas. 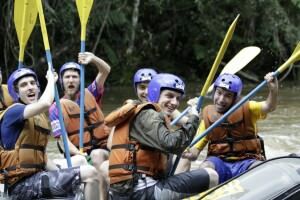 In my time in Brazil I also visited Recife, Foz Do Iguacu and went white water rafting in Juquitiba! 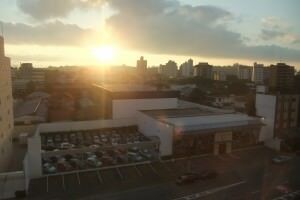 I loved Sao Paulo and I am gasping for more of Brazil, having only visited Sao Paulo, Recife and Foz Do Iguacu so far. I have friends in Curitiba, Sao Paulo and Recife so I am seriously aiming to head back for the 2014 World Cup. It’s football! 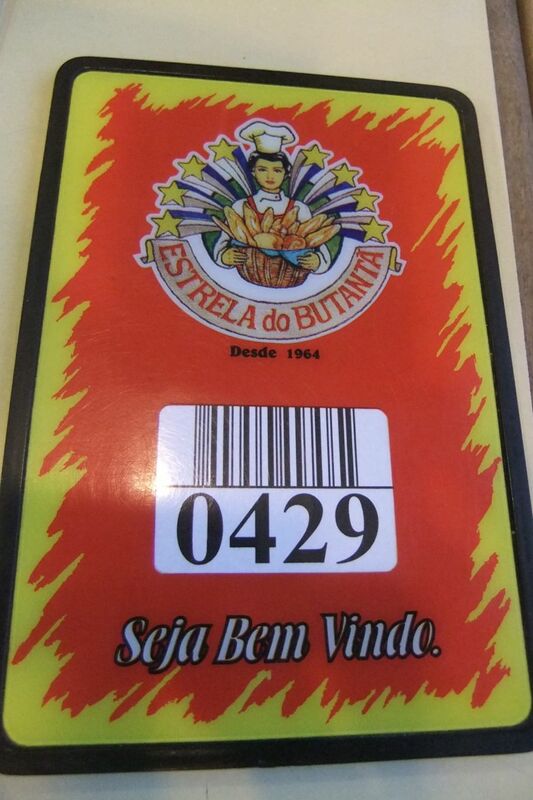 A menu from one of the Brazilian Bakeries in Sao Paulo. 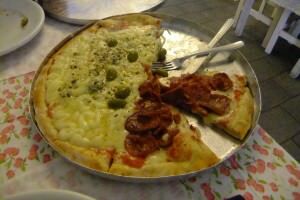 Brazilian Pizza in Sao Paulo Bakeries is Friday’s Featured Food this week, one of my regular features on Don’t Stop Living – a lifestyle of travel! 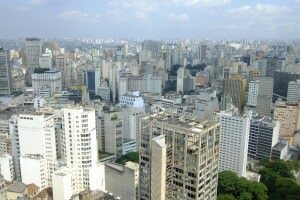 This entry was posted in Brazil, Daily Features, Destinations, Friday's Featured Food, Sao Paulo, South America. Bookmark the permalink.